If you buy a horse at a public sale or auction, you need not have a license. It is only when your horse is entered in a race, or you have put in a claim on a horse about to race (please see previous section on “Claiming”), that the licensing process must be under way. A helpful note: if you as the owner already have a horse entered in a race but have not yet been licensed (whether because the horse has been shipped in from outside California or because you have been unable to appear at the CHRB Office in time), you may send your trainer to the track’s CHRB Office in your stead (along with the applicable $150.00 fee) and he or she can obtain a temporary license – as late as the day of the race – which will permit your horse to run. The “temporary” will be good for 45 days only (no extensions, and no “second” temporaries). 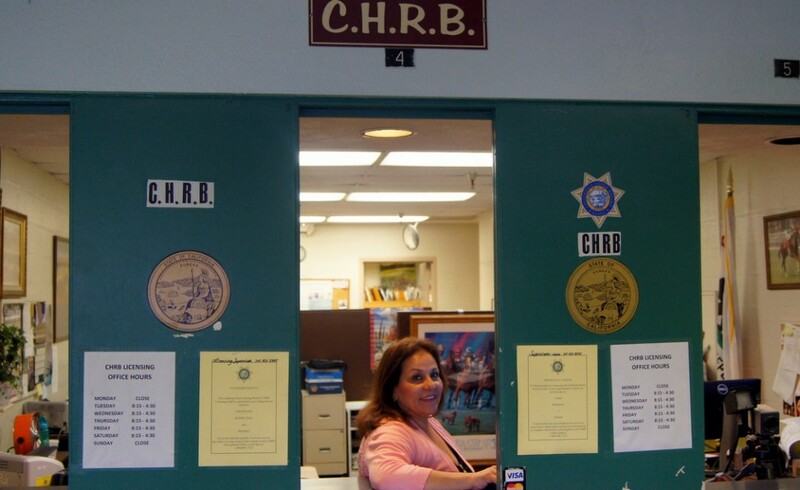 By the end of 45 days you, the owner, must present yourself to the CHRB Office to complete various formalities (such as fingerprinting and photos) required for a permanent license; otherwise, you will forfeit the $150.00 fee and have to start the licensing process over. You must have an owner’s license before you can enter your horse in a race (and in some cases even before you can bring your horse onto the grounds of a racetrack just for boarding or training). But once you DO own a registered racehorse – i.e., through buying at auction or private purchase rather than by claiming – you will find it is a fairly simple process to be licensed. In fact, though it will be more time consuming, you can do most of it by mail. CHRB offices are generally open for business at the racetracks where the current meet is being held. You must request an “Application for License” and a “Supplemental Application for License as an Owner” (See Sample Forms & Charts, Figures 1 and 2) by mail or fax, as long as you have them in time to return them at least 15 days in advance of the date your horse is to race. Further, you will need to supply a personal financial statement (See Sample Forms & Charts, Figure 3) be photographed, preferably at the CHRB Office next time you’re at the track, and finally, supply fingerprints (which can be taken at either the CHRB Office or at a police station). The fingerprints will be forwarded to the Department of Justice for a background check designed to keep “undesirables” out of the horseracing industry. Has been convicted and imprisoned in a California State prison or Federal prison, or convicted of a crime involving moral turpitude; has been convicted of a crime in another jurisdiction which in California would be a felony; has falsified or omitted information during the application process; has committed fraudulent acts in connection with horseracing and/or legalized gaming, or has been convicted of possession, use, or sale of any narcotic, marijuana or other illegal substances. Finally, you must pay a fee of $150.00 for the license, which is good for three years. When it expires, on the last day of your birth month three years later, you may renew it by mail; but if you have a change of address during that period, contact the CHRB or you will not receive a reminder. The CHRB will forward your application to the Board of Stewards, who will review your qualifications, give their recommendation, and then return the Application to the CHRB for final approval. Your license must be presented for validation at the CHRB Office of any new track where your horse has been transported for a meet before the horse can race. The license will generally provide you with free parking and grandstand or club house entry at any racetrack in the state, but some stipulate that you must have a horse racing at that track in order to receive privileges. Please note that if you plan to ship your horse to another state and race it there, you will have to be relicensed in that state. *See Appendix of Organizations for full explanations of CHRB’s function and powers.